Bouncy Ball for Distracted Students! I’ve just got to tell you about something that – well, maybe everyone is already on board with – but I just got to the BOUNCY BALL PARTY! I thought I was being very brave and cutting edge getting an exercise ball for my classroom. I was surprised to learn that so many teachers have already taken the plunge and gotten one for their classroom. But, in case you are like me and don’t already have one, let me tell you – GET ONE SOON! My number one fear was that one of my students would get hurt somehow – either by messing around, or by bouncing and falling off! I was worried enough that I asked my principal for permission before purchasing because none of the other teachers at my school were currently using a ball as a chair. I got permission and I ordered the ball. It’s just your basic exercise ball – no feet and no base. 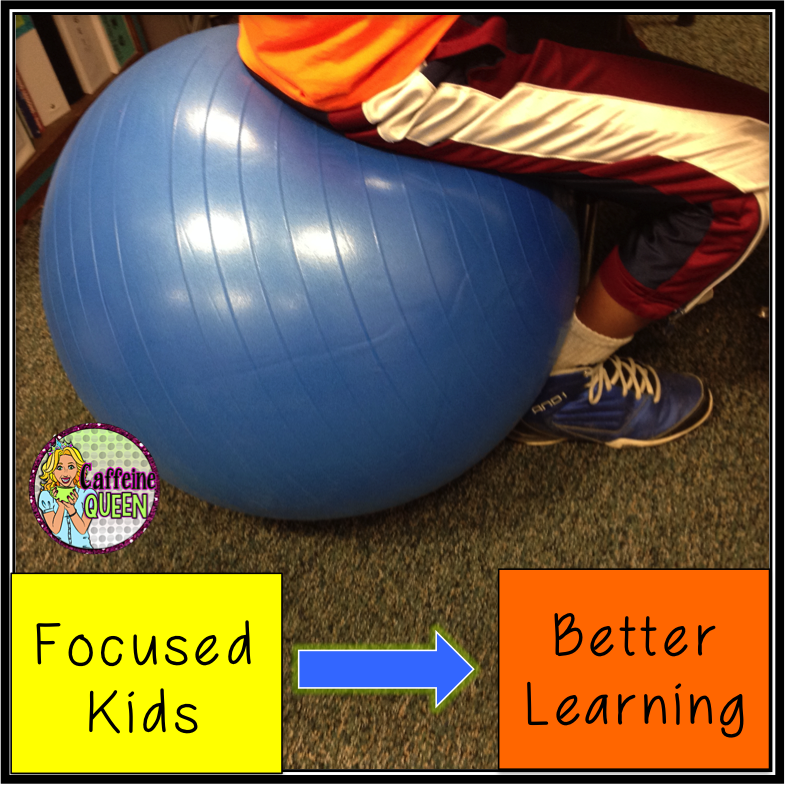 I explicitly taught my students that rolling around on it and/or trying to bounce so high that they would touch their heads to the ceiling were sure-fire ways of not getting to use the ball! I actually bought just the one ball to start with, to use in my small group area (so that I could keep a close eye one whoever was using the ball!!) and I bought it with a few of my students in mind. I’m sure you have similar students – those lacking focus, forgetting to take their meds, and basically bouncing off the walls even without the bouncy ball! Well, it worked like a charm! My biggest problem is that nearly every one of my students wanted to sit on it (who can blame them!) and I couldn’t always give it to the students who needed it the most. Solution – buy more! That’s why I wanted to post this now – it’s “summer” in my neck of the woods. We are out on summer break and it is garage sale time! I’ve passed by these babies before for under a dollar! I’m not sure how many balls are too many, although I’ve read on like about classrooms that have totally replaced ALL of their chairs with balls! I think you have to decide what is right for you and your situation. 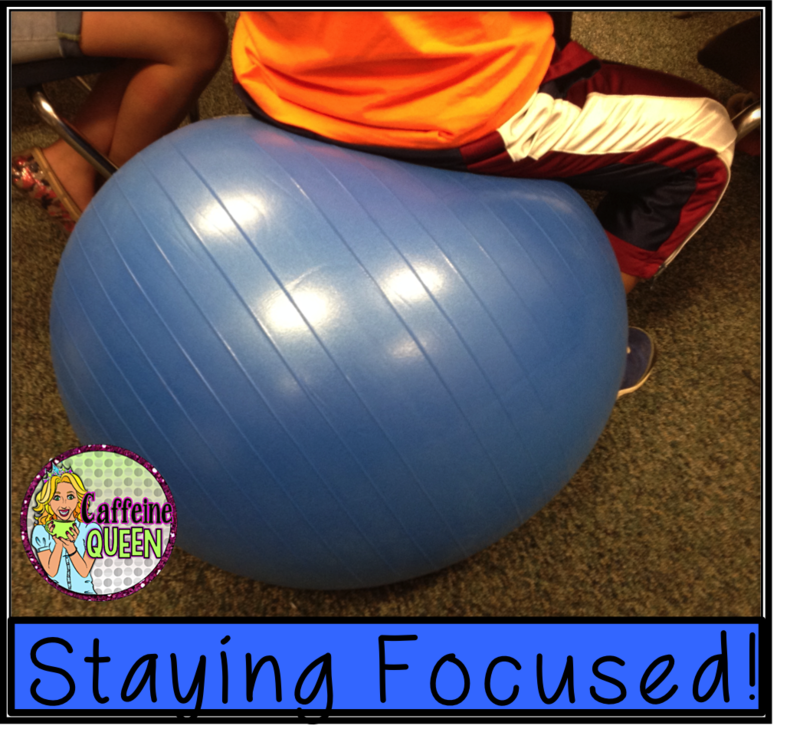 The ball helped my ADHD kids stay focused during reading and math time by gently bouncing on the ball to relieve some of the jiggles, as we call it in my room. I had a student who liked to pace while he thought. Which is fine, except that he also liked to touch others, and their desks as he walked by. This helped him a great deal. Another student suffered from anxiety disorder – another win with the ball! I will say that one of my students with cognitive delays and twitching did not like the ball. He only sat on it when he chose to do so. That’s the beauty of it. I was pleased that my students were able to figure out and verbalize what they needed to be successful. Try it out in your classroom and let me know how it worked for you! I really think you will like the results you get! Please stop by my Teachers Pay Teachers Store and visit Caffeine Queen Teacher on Facebook and Instagram soon! « 2-Digit Multiplication Made Easier!